Serangoon, Clementi and Bukit Timah are among the noisiest neighbourhoods in Singapore, one study has found. What does it mean to be living with noise pollution? The Sunday Times finds out. 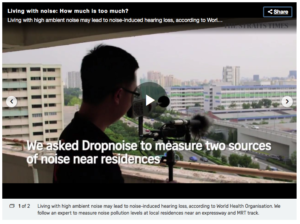 A new study from the National University of Singapore (NUS) found that Singapore’s average outdoor sound level throughout the day is 69.4 decibels, which is equivalent to the noise made by a vacuum cleaner. The study also identified the noisiest places in Singapore. Serangoon tops the list of planning zones, with an average of 73.1 decibels from more than 100 noise readings. Another 49 cases was hauled to court to resolve neighbour disputes between February to September 2016 as revealed during the inaugural Resolving Community Disputes seminar on Friday (Sept 23). Nine of these cases were resolved by Consent Orders issued by the CDRT, where parties agreed to certain conditions. The karaoke singer’s case, for example, was resolved after the tribunal ordered the man to stop singing whenever his neighbour’s family members were having their examinations. The CDRT, set up under the Community Disputes Resolution Act 2015, aims to help neighbours with difficult disputes resolve their conflicts after avenues of community mediation have been exhausted. 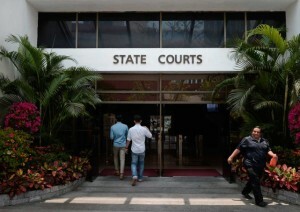 District Judge Samuel Chua said the legislation gives the courts the power to send people for counselling or mediation. “That really helps the litigants to uncover the issues that are underlying the dispute,” he said. In the first three months of operations of Community Disputes Resolution Tribunals (CDRT), close to 30 “neighbours from hell” cases have been hauled to court to resolve ugly community spat. Under the Community Disputes Resolution Act, the tribunals are bestowed powers to resolve neighbours disputes. 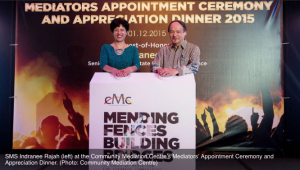 Previously, Community Mediation Centre (CMC) served as the only resort people can turn to if they could not settle their disputes. CDRT has jurisdiction on claims of up to $20,000. An Exclusion Order can also be applied to force the neighbour to move out of his home. 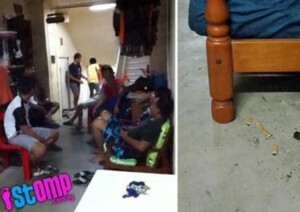 An inconsiderate neighbour turns the common area into a private ‘chillax’ corner for friends’ gathering. They smoke and make noise at the common corridor till early hours in the morning for the past five years. The common area was even converted into a BBQ pit and fixed with fixture to hang their clothes. 26 mediators, equipped with the required experience and skills to handle disputes have been selected to handle cases ordered by Community Dispute Resolution Tribunals (CDRTs). Neighbours who are excessively noisy or hard to live with can now be hauled to court if mediation fails to resolve the issues. Community Disputes Resolution Tribunals (CDRT) commence today, and it will empower judges in ordering an offender to pay damages of up to $20,000, or apologise to his neighbour. 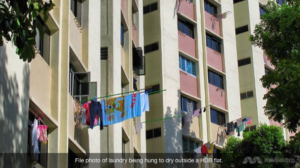 Ministry of Culture, Community and Youth (MCCY) introduced a new approach that allow civilians, as community wardens to assist police in attending to noise complaints among residents. The new approach will be tested out in Tampines North and Boon Lay for six months as part of a new initiative under the Community Disputes Management Framework led by MCCY. Neighbours with unresolved disputes can soon turn to a tribunal for help. Parliament passed the Community Disputes Resolution Bill on Friday that allows a tribunal judge to order an offender to pay damages of up to $20,000, or apologise to his/her neighbour. About 100 responses were received during the 6 weeks long (9 March to 21 April 2014) public consultation exercise on the proposed Community Dispute Management Framework. Despite few participants highlighted formal mediation was not always effective, most respondents were supportive of informal mediation by grassroots leaders and formal mediation by the Community Mediation Centre to help resolve disputes. Eleven individuals received Good Neighbour Awards on Saturday at a ceremony held by the Housing Development Board as part of HDB Community Week 2013. The award recognises and honours residents who have gone through the extra mile for their neighbours. The recipients were selected from a pool of 2,500 nomination entries.